WHAT IS HE COMPLAINING ABOUT? All our lives are in danger…because of you and your policies. Wat is Zuma se verskuilde agenda hierdie keer? Hierdie man spoeg soms baie vuur en glo ook aan “toordery” – hy het al openlik gespog hy het ons blankes getoor lank voor 1994. Het hierdie skielike “gevaar” dalk te doen met Libië? Gaan ons vir die res van ons lewens vir hulle veiligheid verantwoordelik wees, hulle gee niks om of ons uitvermoor word nie? South Africa’s president Jacob Zuma has told how he used to practise witchcraft against white people. Speaking in his native Zulu language at a pre-election rally in the country’s rural north, he told a crowd of his voodoo past. ‘I used to practise witchcraft around here, bewitching the Boers during apartheid’, Zuma reportedly said. He spoke at President Zuma spoke in the village of KaNyamazane during January 2014. Zuma also told the crowd that the ANC would continue to run South Africa ‘for ever’. ‘We will continue to run this government forever and ever. Whether they (detractors) like it or not!’ Zuma said. Although South Africa’s ANC government is predicted to win this year’s election with around 60 per cent of the vote, it is forecast to lose a great deal of popular support. The former liberation party has also been embroiled in a series of highly damaging corruption scandals. 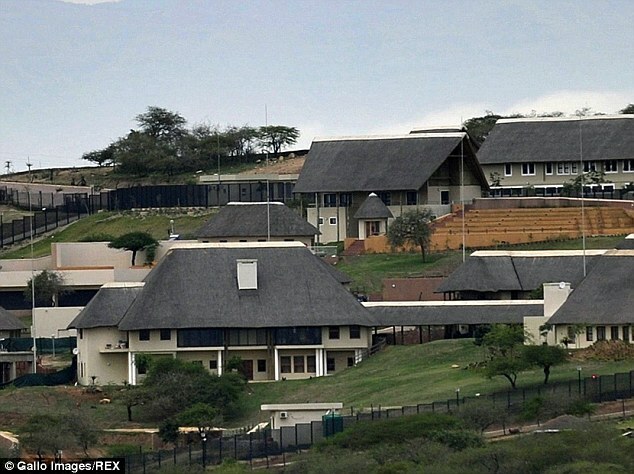 President Zuma is also widely perceived has having personally profited from his presidency by building a lavish £10 million homestead with what is alleged to be taxpayers’ money. Jacob Zuma played a significant role in the ANC’s struggle against apartheid, working as a commander of the movement’s armed wing, the uMkhonto we Sizwe (MK). As part of his underground work for the MK, he travelled incognito around South Africa, helping plot military exercises against apartheid targets. Many South African political commentators have expressed fears that Zuma’s and the ANC’s growing unpopularity may see him and the party try to play on South Africans’ racial fears to win support.